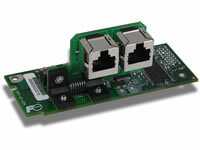 The OPC-ETH multiprotocol communication interface provides Ethernet-based network connectivity to Fuji FRENIC-MEGA and FRENIC-HVAC adjustable speed drives. CAUTION: Do not attempt to downgrade the firmware to an earlier version! Dual-port RJ-45 with embedded IEEE 802.3 10BASE-T/100BASE-TX Ethernet switch supports traditional star and daisy-chain topologies. Shielded RJ-45 connectors accept standard CAT5-type 8-conductor unshielded twisted-pair (UTP) patch cables. USB 2.0 port with mini-B connector provides composite USB device functionality. USB connection allows for product identification and firmware updating. Enumerates as a standard USB mass storage device ("flash drive") for configuration file copying and web page customization. Open XML-based socket data transfer allows end users to create their own custom web server content and load it onto the unit's internal file system via USB. The factory-default web server provides configuration and real-time inverter function code monitoring/control via standard web browsers such as Microsoft Internet Explorer and Mozilla Firefox. Monitor any available inverter function code and send emails to up to four recipients when a certain condition is detected. Twenty individually-configurable alarms are available. All interface configuration files are stored in the unit's internal filesystem in XML format. These files can be transferred to/from a PC via USB, which provides the capability for PC-based file backup and easy configuration copying to multiple units. Configuration files can also be viewed and edited via standard text editors, XML editors and web browsers.